iAssign (interactive Assignments) is a free educational system provided by Laboratory of Informatics in Education (LInE). It is a plugin of Moodle that allow to enrich it with more interactive learning tools, for this reason named interactive Learning Modules (iLM). Bellow we present an image of iAssign, under Moodle 3.6 version, illustrating three situation: the course page with an instance of iAssing activity, a portion of iAssing block of activities, and one of its activity, this one with iGeom as the iLM responsible to increase the learner interactivity with the content (geometry in this case). The iAssign version on Moodle plugins area is not the current one. Bellow you can find the more recent one. Fig. 1. 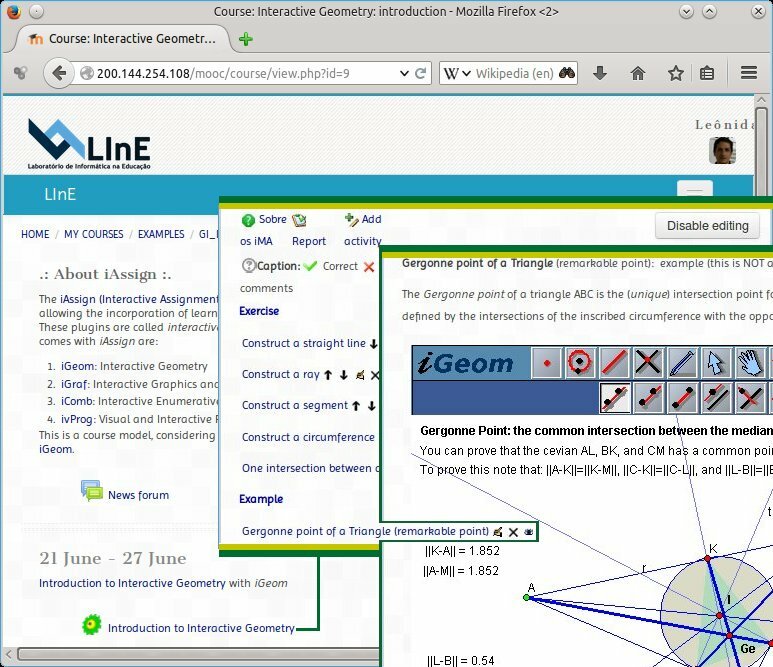 An image with 3 of iAssign interfaces, at left most the course with iActivity, the iAssign block of iActivities and the iActivity with the iGeom (iLM to geometry). The project iAssign (Interactive Assignment) was initiated in 2009, when we decided to abandon our Learning Management System in favor of Moodle. The first version of iAssign was released to Moodle 1.9. It was implemented by Patricia Alves Pereira under the supervision of Leônidas de Oliveira Brandão. This means that any Web system, in principle, could easily became an iLM and be integrated to Moodle under iAssign package. If the iLM offers automatic assessment functionality, iAssign is able to deal with it. By security reason, only the administrator has the privilege of integrating new iLM into iAssign. Once integrated, an iLM can be used by anyone with access to iAssign. For instance, everyone with privileges from teachers on are allowed to use the iAssign authoring tools to create new activities to the students. an example (nothing is recorded). the students have a survey of their activities (including their grades). a filter that allows the insertion of iLM content into HTML text in Moodle. Besides, as the majority of Moodles' modules, iAssign can export any set of iActivitis (perhaps with other activities). There are iAssign available from Moodle 1.9 on. The version allowing the integration of HTML stack packages are those from version 2.5.00, it is the first version on the "download" area bellow. It came with the folowing iLM writen with HTML stack: iVProg, iFractions. Click here to download the latest iAssign package for Moodle 3 (get this if you want to use iLM encoded in HTML stack, as iVProgH). Click here to download the iAssign package for Moodle 3 (previous stable version, do no allow iLM encoded in HTML stack). Click here to download the iAssign package for Moodle 2. Click here to download the iAssign package for Moodle 1.
iVProgH: visual programming (download iVProgH and this set of Web pages). iGeom: geometry and related topics (download iGeom). iGraf: functions in 2D (including calculus tools) (download iGraf).